This 'Heart' Wall Art is crafted from New Zealand Rimu veneer board. 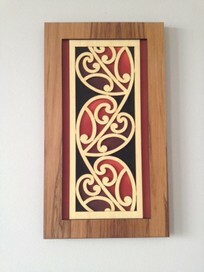 This striking and beautiful wall art depicts contemporary Maori Kowhaiwhai patterns. Overall size 170mm x 300mm x 10mm. My NZ Giftware company Splinters Gifts Ltd produces and trades a full range of Kiwiana Giftware products including NZ Cheese Boards, NZ Pate Knives, NZ Bone Carvings, NZ Greenstone, NZ Wood Carvings, NZ Tea Towels, NZ Art, NZ Ceramics, NZ Wood Kitchenware and Table Mats, NZ Glassware, NZ T Shirts, NZ Coaster Sets, NZ Wall Plaques, NZ Photo Frames, NZ Confectionery, NZ Cushions NZ Cosmetics, NZ Health Products and probably more! So please check my other listings. If you have purchased please pay within 3 days or inform me that you are waiting to win another auction to combine shipping.